Wow, what a weekend that was! I'm not sure whether my feet or my wallet hurt most, but an amazing time was had by all at the UK Games Expo at the NEC in Birmingham this weekend. 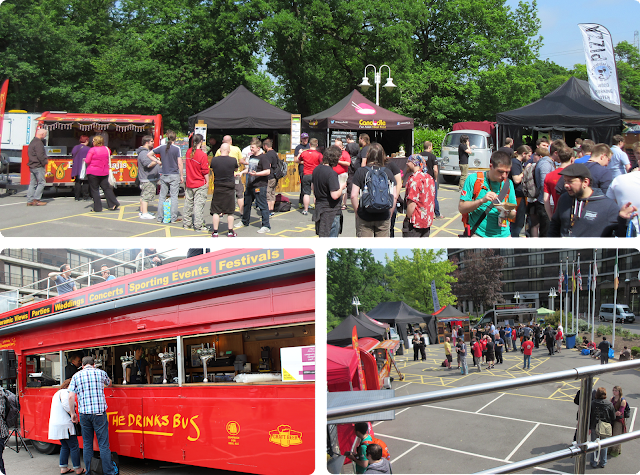 We packed in a lot over the three days; here's what happened on Friday. Celebrating its tenth anniversary, the UKGE has continued to grow in popularity; so much so that for the first time it has outgrown its most recent home in the Hilton Metropole hotel and has expanded to include a trade hall in the neighbouring exhibition centre, which is just a short (and quite pretty) walk away. Having only attended as a day trip before, this year I thought it would be fun to try staying in the hotel and getting in as much gaming as possible. 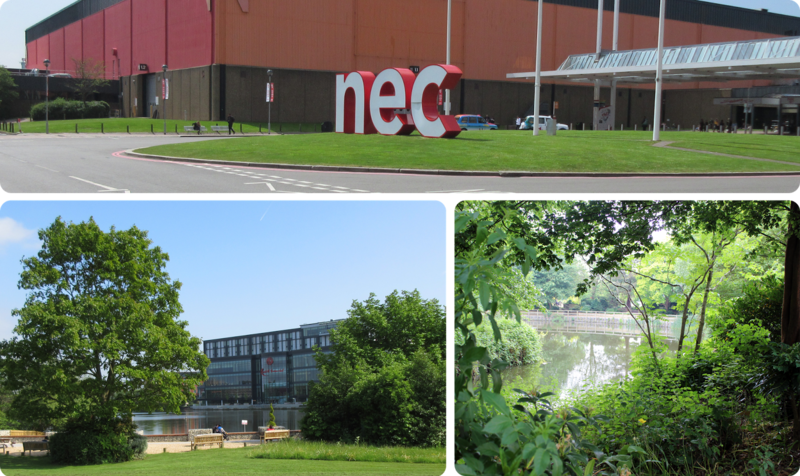 Being next to the NEC, the hotel is nice and easy to find, which was very helpful after my 4.30am start. Next year I'll definitely try to stay the Thursday night as well! I was slightly panicked by the size of the queue, but as soon as the doors opened we were guided very efficiently through into the main hall with no delays - after my cattle-herding experience at MCM ComicCon the week before, this was a huge relief! I had a wander around the huge exhibition room until friends Katie and Jeppers arrived, and we were quickly drawn into a demonstration of two-player abstract game Tatsu at the Gen 42 Games stand. This is a new game from John Yianni, creator of Hive, and is themed after a Japanese legend in which two Dragon Lord armies get trapped in an endless circle of battle by a wizard whilst fighting for the hand of a Princess. Each player gets a set of lovely, chunky dragon pieces in three types: green vine dragons, which can trap your opponent's pieces, blue water dragons, which send your opponent's pieces off of the board, and red fire dragons who destroy your opponent's pieces completely. These effects come into play when you land on the same space as an opponent, with movement determined by the roll of two dice, which you can choose to split between dragons or combine as needed. 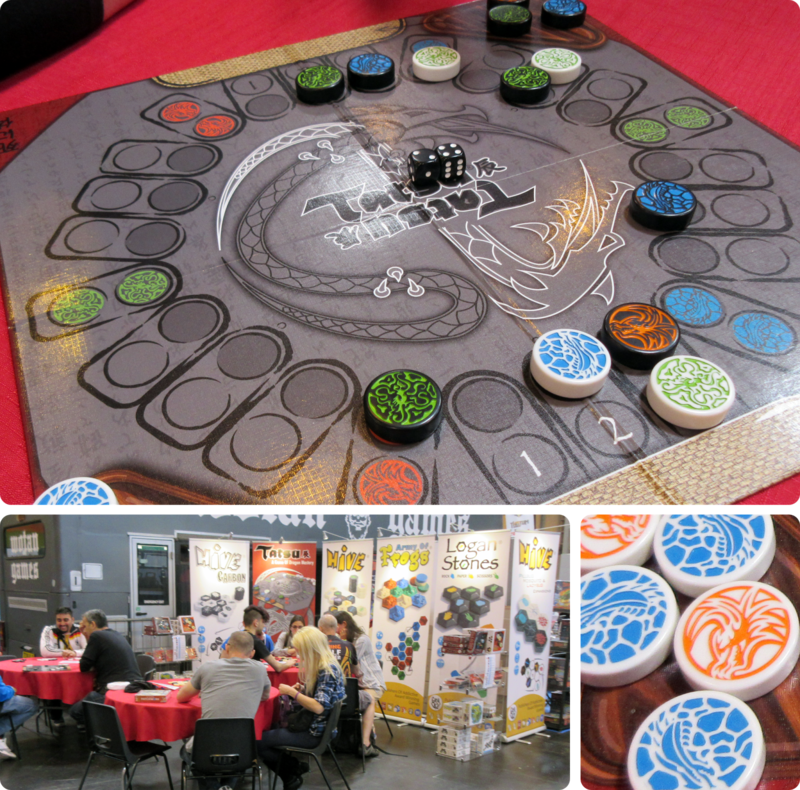 The aim of the game is to win by destroying all of one type of your opponent's dragons, or by removing all their dragons from the board at the same time. This was a fun little game which was easy to pick up and quick to play. I liked the dragon theme, the colourful artwork and the nice chunky counters (which make a satisfying clacking sound when you use them), although after only one play I felt like I won our demo more by luck of the dice than by judgement. I'm sure with a bit more experience of the game you could make more strategic decisions, figuring out when's best to attack or play more defensively. Just across the 'road' from the Gen 42 stall, Geek Attitude Games were demonstrating the prototype of their new game Not Alone, due to come out at Essen Spiel this year. Designed by Ghislain Masson, Not Alone is an asymmetrical card game where players take on the roles of a group of hapless space explorers who've crashed their spaceship into the planet Artemia. The players (or 'Hunted') start exploring their surroundings as they await rescue, oblivious to the fact that they're being stalked by a nasty alien creature (the 'Hunter'), played expertly in our game by Etienne Espreman of GAG. To win the game the Hunted need to survive long enough to be rescued, represented by a ship marker that needs to get to the middle spot of the scoring track. The Hunter wins the game if he beats us to the middle spot. Each turn we secretly choose where we'll be exploring (picking one of a number of location cards) and then the Hunter announces which location they will strike. The more we get caught, the faster the Hunter moves down the track. If we don't get caught, locations have special abilities that can be activated to speed up rescue or help us manipulate our location cards. This was great fun - it's genuinely really tense as you wait to find out whether or not the Hunter will catch you. We only played a prototype of the game, so I can't wait to see what the final version will look like. Definitely one to keep my eye on. Unbeknownst to me at the time, this demo was being run by Paul Grogan of Gaming Rules! fame who I've since met to apologise for not knowing who he was! Such a nice guy. 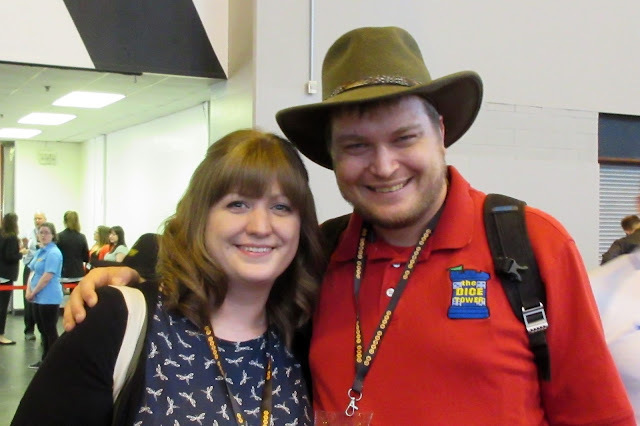 In fact, this was a recurring theme for the weekend - everyone I met was lovely, kind, happy to be there having fun and just generally awesome. What a great hobby! 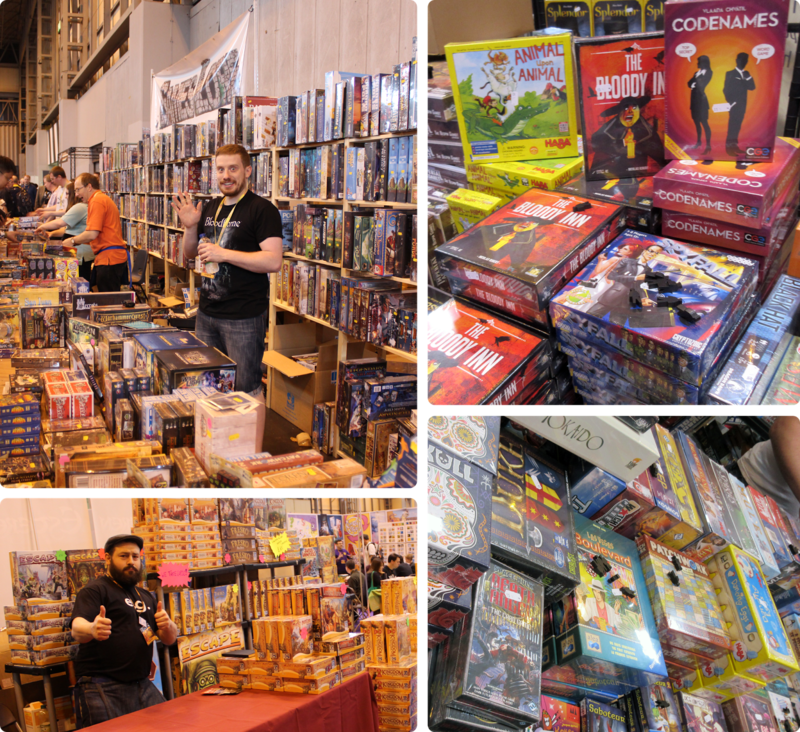 I can't talk about the Expo without at least a couple of pictures of the mountains of board games for sale at the various retailer stands. My favourites for range of stock and general friendliness had to be Gameslore and Board Game Guru where I made most of my purchases for the weekend (although the Queen Games stand made the photo-cut too due to the awesome pose, see bottom-left). It must be a ridiculously long weekend for them all, but they still manage to be cheerful, helpful and knowledgeable throughout the whole event. Done with the NEC hall for the day, we headed back to the hotel to watch a live recording of the Shut Up & Sit Down podcast. Co-host Paul Dean took the time to shake each and every person's hand as they walked in, which was very sweet. 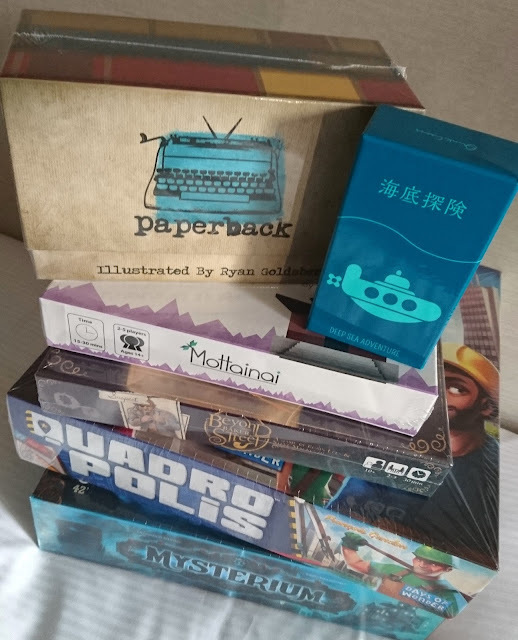 The team talked through all the games they'd played so far, including penguin-flicking dexterity game Ice Cool, new Richard Garfield game Treasure Hunter, Codename Pictures (which I would finally get to play on Saturday) and Deep Sea Adventure. 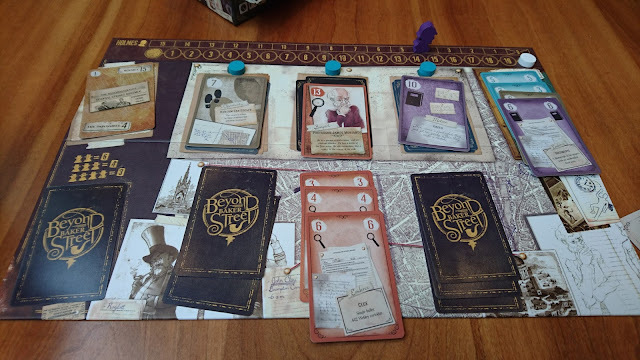 I'd bought Deep Sea Adventure about half an hour before the show, so I was slightly panicked to see it come up at the start of their 'disappointing games' section, until they said their slides were in the wrong order and that they really liked it - phew! They also took questions from the room, but made it more fun by getting everyone to write their question on a Jenga block (actually an ersatz Chinese Jenga-substitute 'Wood Toy Folds High' block, for reasons of cost) which they could then pull from a tower and answer until it toppled. All of that day's walking around meant everyone was definitely ready for dinner. As well as the hotel and NEC catering arrangements, the organisers had laid on a mini food fair in the Hilton car park, with various different cuisines available and a big red double-decker beer bus to top it all off! After dinner we got to play a few of the games we'd picked up during the day, starting off with Deep Sea Adventure, a tiny Japanese game from Oink Games where poverty-stricken divers with a shared submarine (and oxygen tank!) push their luck to bring home the most treasure. 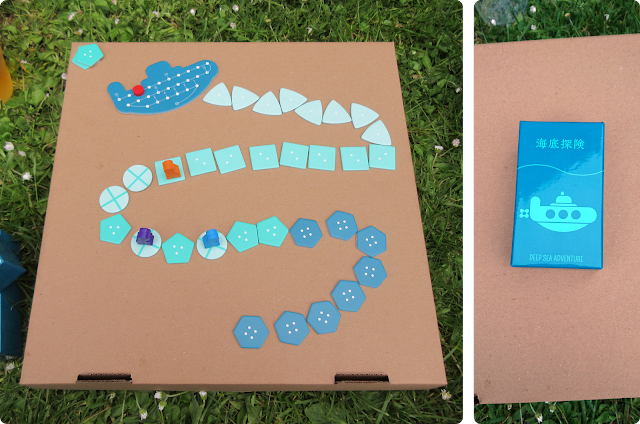 Small enough to play outside on a pizza box, as you can see, this packs a lot of fun into a very small package. We were all horribly drowned by our own greed, so definitely need a bit more practice at this one! As the evening drew on, we moved inside and found a table in one of the many open gaming areas provided for us by the hotel and cracked open Beyond Baker Street. This is a bit like a crime-based version of Hanabi where you face your hand of cards away so that you can't see them but everyone else can, then try to give the others information about what cards they have to help them play the right ones. In Beyond Baker Street you're trying to solve a crime and have to confirm your suspect, motive and opportunity by gathering clues up to the correct value before Sherlock Holmes beats you to it. We only tried out the introductory game, but more advanced games add character cards that help or hinder you and make the game a bit more variable. I can't wait to play this some more - it was fun, but I want to see what the other cards add to make it a bit tougher than the training game. Next up (along with a round of extortionately expensive hotel tea): Quadropolis. This was one of the hits of the weekend for us, I think. After playing my copy on the Friday night, Katie and Jeppers both ended up with their own copy on Saturday. Quadropolis is a tile-laying city-building game where players take turns to claim tiles for their city from a central grid using one of their four 'architect' tokens (numbered 1 to 4). Taking tiles and adding them to your city has to follow a number of rules, though. Say you place architect 3 next to a row in the central grid; this means you can take the third tile along. This also has to then be placed in row 3 or column 3 in your own little city. Some buildings generate inhabitants or energy in the form of delicious-looking plastic components that help you activate buildings to score victory points at the end of the game. Different types of buildings score points in various ways, some benefiting from placement of building types, others from inhabitants, height or number. The player with the most victory points at the end of four rounds wins. This was a really fun little puzzle, although we've only tried out the 'classic' setting and the game comes with tiles for an 'expert' mode as well, so I need to give that a try soon. More detailed thoughts on these games to follow once I've tried everything out a bit more. 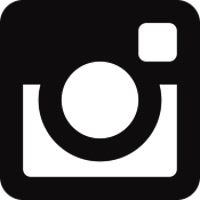 If you enjoyed this post perhaps you could take a look at my Facebook page and leave a like or come and say hello on my Instagram feed!